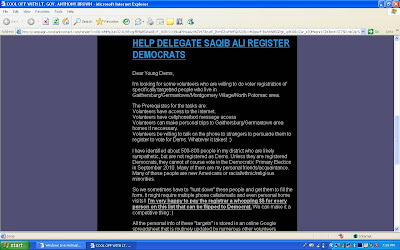 Is Saqib Ali Buying New Democrats? 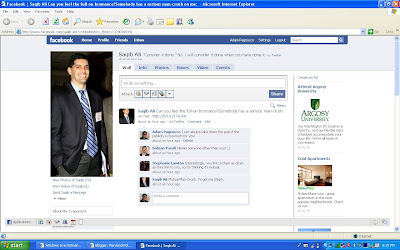 Yes, yes, we know some of you are asking us whether we plan on re-naming this blog “Saqib Politics Watch.” But this is not just another Facebook-related post. Read on. I’m looking for some volunteers who are willing to do voter registration of specifically targetted people who live in Gaithersburg/Germantown/Montgomery Village/North Potomac area. 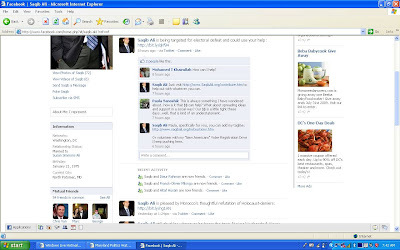 Volunteers have access to the internet. 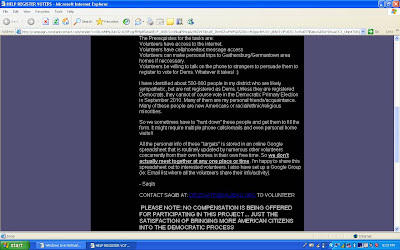 Volunteers have cellphone/text message access. Volunteers can make personal trips to Gaithersburg/Germantown area homes if neccessary. I have identified about 500-800 people in my district who are likely sympathetic, but are not registered as Dems. 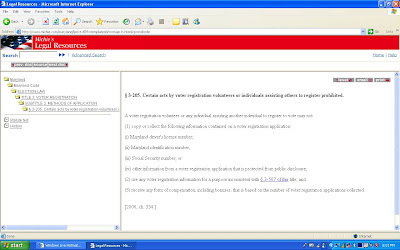 Unless they are registered Democrats, they cannot of course vote in the Democratic Primary Election in September 2010. Many of them are my personal friends/acquaintance. Many of these people are new Americans or racial/ethnic/religious minorities. 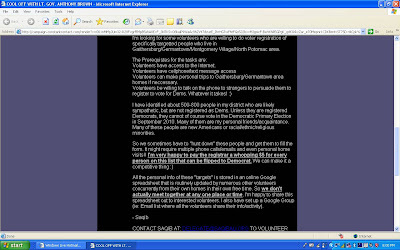 All the personal info of these “targets” is stored in an online Google spreadsheet that is routinely updated by numerous other volunteers concurrently from their own homes in their own free time. So we don’t actually meet together at any one place or time. I’m happy to share this spreadsheet out to interested volunteers. I also have set up a Google Group (ie: Email list where all the volunteers share their info/activity). So we sometimes have to “hunt down” these people and get them to fill the form. It might require multiple phone calls/emails and even personal home visits!! None of the above establishes that Delegate Ali actually paid anyone for voter registrations, but the State Board of Elections may want to find out. As for Delegate Ali himself, well... his enemies are watching. 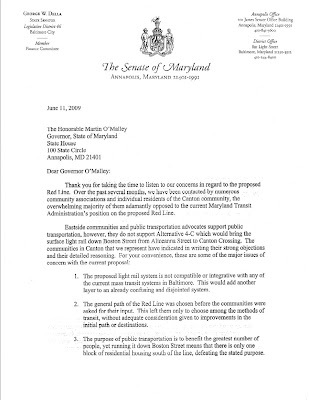 Eleven state legislators from Montgomery County and two state legislators from Frederick County signed a joint letter yesterday calling for light rail on the CCT and toll lanes on I-270. All of the legislators are Democrats except Frederick Senator Alex Mooney (R-3), who is a Republican, and Frederick Delegate Richard Weldon (I-3B), who is a former Republican and current Independent. We are writing to express our fervent support for the Corridor Cities Transitway (CCT), which is our number one transportation priority, to stay on track for construction in 2012. This project is shovel-ready with the right-of-way largely set aside. There is little or no opposition in the community with strong local business and government support. Compared to other mass transit projects, the overall costs are very modest. We urge creativity in financing, including a public/private partnership and a combination of federal, state, and local aid. By providing a link between many communities - Clarksburg, Germantown, Gaithersburg, and Rockville - to the Shady Grove Metro Station, this project will benefit commuters in some of the fastest growing communities in both Montgomery and Frederick Counties and alleviate traffic congestion in the I-270 corridor. In addition, the CCT will play a vital role in the continued economic development of Montgomery and Frederick Counties and the state. We believe that light rail should be the mode choice for the portion of the route from Shady Grove to Clarksburg. Economic development is more likely near light rail transit, and light rail promotes a more high quality transit-oriented development in burgeoning town centers. Studies have shown that more people choose to get out of their cars for light rail, as opposed to bus-rapid-transit (BRT). Light rail would have lower operational costs than BRT because, as demand increases, more rail cars can be added at no additional personnel cost. However, if BRT is the necessary choice due to Federal Transit Administration cost effectiveness requirements, then we urge that such BRT truly be a “rail on wheels” system, without compromising the advertised service level, speed, and quality. Additionally, we support two Express Toll Lanes (ETLs), as a component of this project, to help reduce congestion on I-270. We also think that the Montgomery County Planning Board's recommendation of reversible lanes is worth further exploration, as it could alleviate traffic congestion while mitigating negative environmental impacts. These ETLs should be combined with general-purpose lanes without tolls, so that these new transportation facilities will be financed in large part by private investments. We thank you in advance for your attention to these important matters. My condolences go out to the family and friends of Stuart Rochester. Stuart Rochester died Wednesday, July 29. The funeral service will be tomorrow, Friday, July 31 at 11 am at Tikvat Israel Congregation, 2200 Baltimore Road, in Rockville. Interment at Judean Memorial Gardens in Olney. 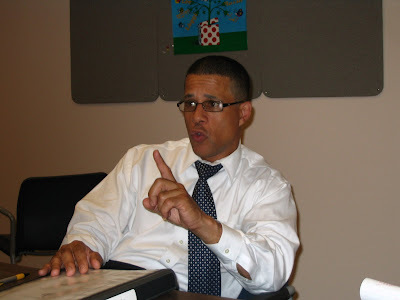 Stuart Rochester was a colleague and a fierce and extremely intelligent advocate for the people of Montgomery County but even more so for the residents of Burtonsville and the East County. I have known Stuart for many years. My first interaction with Stuart was dealing with the ICC. It’s no big secret Stuart vehemently opposed the Northern Alignment for the ICC. Stuart felt the huge trucks that traverse 198 each day destroyed the community of Burtonsville and Spencerville and Stuart wasn’t going to let that simply pass. Stuart also argued that there was inequity between the eastern part of Montgomery County and the Western side (Potomac). He felt we were shortchanged with respect to money for education and infrastructure. He felt we received the challenges but did not get the resources to address those challenges. As only one example the schools on the Western Side were always in top shape while we had to wait for any improvements with numerous portables. Paint Branch High school was a prime example. We have lost so many valuable community leaders recently that Montgomery County will most certainly suffer. These people are the core to the making of good government. Stuart was the most articulate civic activist I know. During my term as President of the Civic Federation, Stuart was kind enough to be our representative for the Print Media. I remember Stuart enjoyed writing op-editorials for the Gazette and really loved taking on the Gazette Editor Chuck Lyons. I remember feeling they were two sides to the same coin but Stuart was always the one more capable and equipped with his sharp wit. I worked with Stuart on many issues facing Montgomery County and he supported my campaign this past special election. I will miss Stuart’s support and passive guidance. Stuart never was one to be in front of the camera, he always felt easier behind the scenes making sure the “i” was dotted and the “t’s” were crossed. On the last Montgomery County Civic Federation meeting he reported on the Zoning rewriting committee and most especially the new commercial mixed-use zone. He cautioned us that this zone could, if not monitored, be deleterious to Montgomery County. He was on the exemption committee and reminded all of us that the devil is in the detail. Stuart’s guidance was never misplaced with me. Stuart will be missed and my prayers are with his wife Shelly, his kids and his grandkids. I hope they know how much we in Montgomery County respected and appreciated Stuart. “What is this Montgomery tofu-head trying to put over on me, anyway? Has all that brie rotted his brain? Does he think Baltimore wants to keep feeding on crumbs from Montgomery’s table? Shove that! We want more of the feast. We can take all the growth that comes our way without whining about traffic. “And if we don’t get high-tech jobs in Baltimore, we want them a lot closer than freaking Montgomery County. My kid, who just graduated from UM with a computer sciences degree, doesn't want to commute to Gaithersburg even with the ICC because the tolls will cost an arm and a leg. He’d rather get a job somewhere on Interstate 95 where people won’t look down on him because he drinks Natty Boh instead of Cos-mo-pol-i-tans. “And why does this guy keep going on about Baltimore city? Doesn’t he realize he’s up against Baltimore County and Howard County and Harford and Anne Arundel too? None of us get squat from new jobs along I-270. We want them on the eastern end of their precious ICC. And it just so happens we have pals in Prince George’s and Southern Maryland and the Eastern Shore who feel the same way. OK, Baltimore Guy, back in your box. We want to keep it civil here. Sorry, Adam, Baltimore Guy’s been a little touchy since his industrial base went away. We love honesty and Dresser gave us a big dose of it. This is far better than listening to another awful “we’re all in it together” speech! For all the sound and fury surrounding the I-270 project, it will not be the near-term battlefield for Free State sectarianism. The real conflict will take place over the FY 2011 and FY 2012 state budgets. We have blogged several times about Senate President Mike “Big Daddy” Miller’s intention to send teacher pensions down to the counties, a move that would disproportionately devastate MoCo. The state’s never-ending budget disaster makes that much more likely next year or the year after. But for all the talk about ending the one state program that may actually benefit MoCo in net terms, no one is discussing ending the state’s 100% subsidy for Baltimore’s Community College, Detention Center and Central Booking Facility. Let’s view once again the state’s $185 million handout from the Governor’s FY 2010 budget – a special deal that no one else in Maryland can ever hope to get. What would happen if that aid ever wound up on the chopping block? The Baltimore delegation would fight like hell and the Sun would have their backs. Meanwhile, the Washington Post’s clueless Boy King has already asked the Governor to send teacher pensions down to the counties. We hope our state delegation understands what they’re up against. The following pictures were taken by District 17 Senate candidate Cheryl Kagan when she was recently on board a traffic plane. They are some of the most remarkable images of Montgomery County that you will ever see. Is this how the GOP plans to revive its moribund party? After discussing a few policy issues with Lieutenant Governor Brown, we shifted to the political landscape. Brown’s answer to my question of how often he came to Montgomery County, which gave O’Malley/Brown more votes than any other county in the state, was the nice and political “not enough.” He discussed the effort both he and the Governor make to get outside of Annapolis to see state programs, meet with business leaders, and engage with the community. The “Maryland Capital for a Day Program,” where O’Malley goes to different locations around the state with his cabinet to perform state business, demonstrates that effort. He also said Montgomery County would be a more frequent destination in the future, which is not a surprise given its importance in Maryland elections both for votes and fundraising. Brown also compared his boss to the previous two governors, who he experienced as a member of the General Assembly. Not surprisingly, he had a lot of nice things to say about his boss’ policy aptitude and political sense, admitting he was learning a lot from working for him. But I also asked about their specific interactions with the legislature. Governor Ehrlich was notorious for not engaging in the legislative process, though to be fair he was a Republican dealing with overwhelming Democratic majorities. But to paraphrase Brown, Ehrlich had no interest in governing at all and when he left there was no evidence of his presence in state government. Brown said that when he first came to the legislature in 1999, Governor Glendening was engaged with legislators and his policy people were always willing to help with bills. Brown has tried to emulate that approach. He also refuses to sit in his office and have legislators come to him, but likes to make the most of his legislative experience to engage directly with his former colleagues on whatever issue needs whipping. At my request, we mostly skipped discussion of 2010 in favor of longer term politics. When I asked Brown about his future, he said his goal has always been to put his skills to the best use possible to serve others. When the O’Malley/Brown Administration comes to an end, that could mean running for governor in 2014, returning to his private legal practice, or taking advantage of other opportunities. But his focus was on his current job as Lieutenant Governor and reelection, though he did return to the thought of a gubernatorial run and signaled he was more likely than not to head in that direction. After our meeting, Brown went to do a little politicking with the Montgomery County Young Democrats, where a large turnout welcomed the only statewide elected official to not claim some Montgomery County tie. By Elaine Amir, Johns Hopkins University. The Montgomery County Planning Board has adopted a visionary new Gaithersburg West Master Plan that will allow true smart-growth development to take hold in an expanded Shady Grove Science Center, right in the heart of Montgomery County’s I-270 science and technology corridor. The new plan provides for long-term growth of the Shady Grove Science Center, with a continued focus on research jobs and healthcare. For the first time, it also allows a mix of housing and retail in an area that was limited to commercial use only in the old plan. 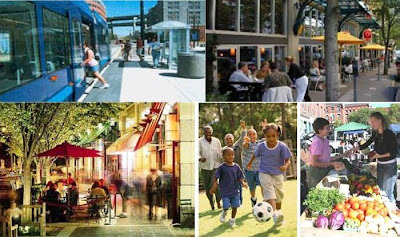 This is exactly what smart growth advocates have wanted to see more of in the I-270 corridor: A vibrant, walkable community, with improved pedestrian, bike and transit access. Right now, workers in the Shady Grove Road area have to get into their cars and drive if they want to meet someone over a cup of coffee. The new plan would allow people to walk from their offices to a meeting, or to a sidewalk café, or home for lunch. New parks and community recreation facilities would also be integrated into the community, and all of this will be located within convenient walking distance of three new transit stations. The Corridor Cities Transitway (CCT) connects this area directly to the Shady Grove Metro station, King Farm, Washingtonian Center, Germantown and other key points all the way to Clarksburg at the northern end of the CCT alignment. 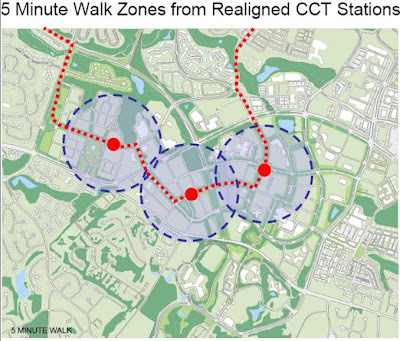 Nearly the entire plan area falls within a 5-minute walking radius of the CCT. The entire Life Science Center and many surrounding neighborhoods lie within a 10-minute walk. By changing the design of the life sciences center, introducing a more walkable, transit-oriented design, and a mix of jobs, housing, shopping and entertainment, we hope to provide the kind of environment that can attract the best and the brightest scientists and entrepreneurs to live and work here. This is the kind of community that will foster innovation and help transform great scientific discoveries from our research labs into the latest medical advances to improve people’s lives. Isn’t this the kind of future we want to see for the next generation here in Montgomery County? Great jobs with great futures, in key growth industries such as healthcare, bio-science and related fields are not a bad thing in this economy. The millions of dollars in new annual tax revenue will also go a long way towards ensuring our future prosperity. Great opportunities exist to build partnerships among leading scientists, teachers and students to reach out to our children and get them more excited about careers in science. I think this plan will be looked back upon as the defining moment when Montgomery County chose to complete the vision that was first laid out more than two decades ago for a thriving 270 technology corridor, and updated that vision with a new, more sustainable community design. 1. This New Plan is a Huge Improvement over the Current Master Plan. 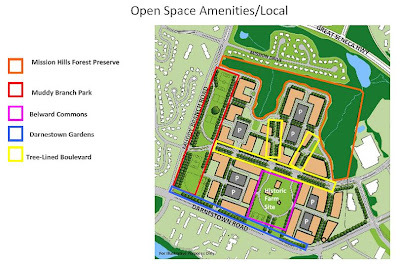 The existing plan for the Shady Grove Life Sciences Center allows up to 13 million square feet of mainly commercial construction, 38,000 jobs, and virtually no housing. It also includes very limited pedestrian, bike or transit access, and no requirement that any significant transit service be provided before additional development can happen. The new Gaithersburg West Master Plan would transform this single-use, commercial area, filled with low-rise office parks and acres of surface parking lots, into a vibrant town center that feels more like a community. The new plan will have some taller buildings right around the new CCT stations, to provide more compact, transit-oriented design so we can move from parking lots to parking garages that take up less space. The new plan also adds a local street grid with smaller blocks and more connection points to disburse traffic, plus intersection and pedestrian improvements, new sidewalks, common areas and parks. And finally, one of the great advantages of the new plan, from a countywide standpoint, is that it would allow an additional 22,000 science and healthcare-related jobs – and an estimated $176 million in new annual tax revenues for the County – but these new jobs are allowed only if new infrastructure is provided first. 2.The New Plan Contains Strict Staging Requirements. The Current Plan Does Not. In the new Gaithersburg West Master Plan, development can move forward only if needed infrastructure is funded and built beforehand. There is no such requirement in place under the current plan. In fact, the “staging requirements” in the new Gaithersburg West Master Plan actually would allow LESS development in this area (no more than 8.6 million square feet) as compared to the current 13 million square feet in the existing master plan, until construction funding is provided for the CCT. Full build-out cannot happen until the entire CCT is up and running. In some ways, the new Gaithersburg West Master Plan imposes TIGHTER restrictions on future development than the existing master plan. Between the CCT, planned improvements to I-270, a new pedestrian-oriented street grid, and mixed-uses to allow more people to live near work, we can significantly increase the percentage of non-auto trips generated in this area. The Planning Board has established a detailed and effective program for managing transportation needs in a smart growth, transit-oriented manner. 3. The New Plan for Johns Hopkins Belward Research Campus: Great Science, Great Jobs, Great Place to Work and Play. Continued growth of the Life Sciences Center and the Belward Research Campus is critical to Montgomery County’s efforts to remain competitive as a global center for scientific research. Belward will provide a campus-like setting for good bio-science, healthcare and related jobs over the next 30 to 40 years. This will allow us to fulfill our mission for groundbreaking scientific research to help improve people’s lives. The new plan also will make this whole area a much more exciting and healthy place to work, with new recreational facilities, more public and open space, and other work-life amenities. While the Planning Board did scale back the scope of the research facilities Johns Hopkins had requested for the Belward campus, the Board still recognized the need for a sound guiding vision that will help transform the area into a vibrant, transit-oriented, science-based community that will attract the next generation of knowledge workers on which the bio-science industry depends. And since 45% of the Belward site will be preserved as parks and community/recreation space, there will be new sports fields, natural areas, and lots of other new amenities for our scientists, students and neighbors to enjoy. The old plan had just 25% open space. The new plan preserves 45% of the Belward Research Campus as parks and recreational space. No permanent housing will be allowed at Belward. 4. The Community’s Voice has been Heard in Crafting this Plan. Johns Hopkins University has been meeting with community representatives throughout the planning process, for over three years. We have found broad support for creating the kind of place where we can bring together great scientists and researchers, create thousands of good jobs, and help transform the Shady Grove Life Sciences Center into a much more vibrant and attractive place to live and work, for our children and for generations to come. The new Gaithersburg West Master Plan is one of the best opportunities we will ever have in Montgomery County to retain our edge in biotech, health and informatics, and create a truly transit-oriented, smart growth community, in the heart of what has long been planned as a major development corridor for our region. The Planning Board has produced a plan that is both workable and visionary, and preserves the residential character of the surrounding neighborhoods. We hope the community can see the value it will provide for years to come. We look forward to working with the County Council to put this visionary plan into action and create the kind of community where great science, great jobs, and real transit-oriented-design all come together to make Montgomery County an even better place to live, work and play. Elaine Amir is Executive Director of Johns Hopkins Montgomery County. Tues, July 28th at 9:30 p.m.
Wed., July 29th at 6:30 p.m.
Thurs, July 30th at 9:00 p.m. Fri-Sun., July 31st-August 2nd at 6 p.m. Topics that will be discussed include the Washington Post's assertions that Unions wield too much power in Montgomery County, whether school pension liabilities (of approximately $700 million) will be shifted from the State to the Counties during the next budget season and whether a rift is developing between members of the Montgomery County Council and members of Montgomery County's State Delegation. After discussing the budget and education, Lieutenant Governor Brown turned to the topic of transportation. Cavan Wilk from Greater Greater Washington took the lead in questioning Brown on the issues, since it is his area of expertise. Cavan Wilk, Anthony Brown and Press Secretary Mike Raia. As discussed last time, Brown has a few areas the Governor has given him the lead on. Outside of the BRAC Subcabinet, those issues are not really transportation related. But the Lieutenant Governor was previously a land use and zoning attorney and dove right into some difficult transportation questions. Brown said a gas tax increase was off the table in 2010, with Marylanders already pinched by salary cuts, unemployment, and other effects of the recession. But Brown did discuss how existing transportation revenues could be used better, with a particular emphasis on mass transit. He acknowledged that finding the right mix of transit versus roads was difficult, and even within each area there were many questions: rail or bus; maintenance of old roads or bridges or construction of new ones; and so on. Brown identified three Administration priorities for transportation: The Purple Line, the Red Line, and the BRAC Intersection program. Every other project is about finishing, fixing, or maintaining, not starting anything new. Brown was not yet up to speed on proposals to expand 270 and/or construct the Corridor Cities Transitway. Brown also highlighted the Administration’s MARC train plans. The plan goals are ambitious, but Brown took umbrage at the idea that instead of improving MARC, the system was actually moving in the other direction due to the cuts enacted in 2008 that reduced service and effectively increased fares by eliminating certain multi-ride passes. The Lieutenant Governor talked about short term advances that had occurred, including new trains (which was happening prior to the Administration’s plans), improving parking, and renovating stations and platforms. He also said discussions were ongoing with CSX to help address freight traffic issues. As readers of the blog know, two of the MARC train lines are owned by CSX, who control dispatching on the lines. The state is continuing its efforts to coordinate scheduling better with freight trains. But Brown was more passionate talking about long term MARC train plans, including serving new locations. Those plans are more grandiose and nice ideas, but seem fantastical when track switches and signals are malfunctioning on an almost daily basis. Wilk also kept after Brown about his role in the BRAC Subcabinet and how to address the increased traffic that will be caused by the newly consolidated Walter Reed at Bethesda Naval Medical Center. Brown differentiated Bethesda from other military installations benefiting from BRAC, due to its more urban location. But he also emphasized that the intersections around Bethesda Naval were failing independent of any increased BRAC traffic, so addressing Wisconsin, Jones Bridge, Connecticut, and adjacent roads would be necessary whether Walter Reed moved to Bethesda or not. BRAC just brought more attention to an existing need. Brown conceptually agreed that expanding roads would, in the long term, just lead to more cars filling those lanes. But he was not prepared to embrace a specific and aggressive transit alternative. He said he has been working with Congressman Van Hollen on some type of transit improvement, but whether that would be a pedestrian bridge, an underground tunnel, a new entrance to the Medical Center Metro Station on the east side of Wisconsin, or other innovative approaches such as higher subsidies for employees to ride instead of drive was not yet known. With the expanded facility set for full operation in 2011, Brown and Van Hollen will need to act much quicker if they hope to affect transportation around the project. 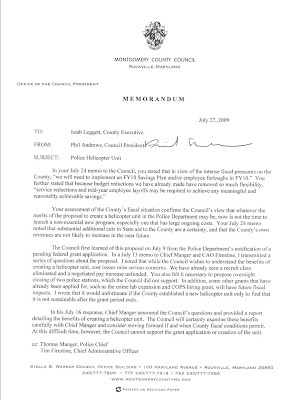 Following is the text of a memo on the budget written by County Executive Ike Leggett to the County Council. He estimates a $370 million budget deficit for FY 2011 and argues that furloughs are needed in the current budget year. He also predicts that if the county is found to have not satisfied the state's Maintenance of Effort requirement for school funding - a real possibility - the county could be penalized $33-57 million by the state. • other unanticipated events (e.g. fuel price spikes, extraordinary stock market losses, etc). Preliminary indications are that FY09 tax-supported revenue collections for the operating budget are, generally, on target with the March projections. This means that we can not reasonably expect any budgetary relief from future increases in local revenues, and will monitor indicators carefully for the possibility of a slower than anticipated recovery. The fact that we are on tract with our revenue estimates does not alter the projected $370 million gap for FY11. The expenditure projections contain approximately $57 million of expenditures for Montgomery County Public Schools (MCPS) and Montgomery College (MC) above Maintenance of Effort (MOE) requirements. While additional time is needed to evaluate economic and fiscal data due to the already clear magnitude of the problem, we will need to implement an FY10 Savings Plan and/or employee furloughs in FY10. I do not approach either issue lightly though. Given, the position and service reductions made in preparing the FY10 Operating Budget, we will be very constrained in our options for an FY10 savings plan. Increases in lapse, elimination of nearly 400 positions, and other budgetary reductions have removed much of the flexibility that previously existed for instituting mid-year savings plan. For an FY10 savings plan, service reductions and mid-year employee layoffs may be required to achieve any meaningful and reasonably achievable savings. As indicated in my FY10 Recommended Budget, employee furloughs may be an option, or supplement to a savings plan, since it would result in only temporary service reductions and would provide a source of feasible savings to carry forward into FY11. However, any furlough should be implemented across all tax supported agencies to ensure equitable treatment of employees and to produce substantive savings. In closing I want to stress that, jointly, we have reduced cumulative gaps of nearly $1.2 billion in the last three years. I believe by continuing to work together we will produce a balanced budget in FY10 and FY11 that preserves essential services in education, public safety, and our social services safety net and aligns our ongoing expenditures with our resources. 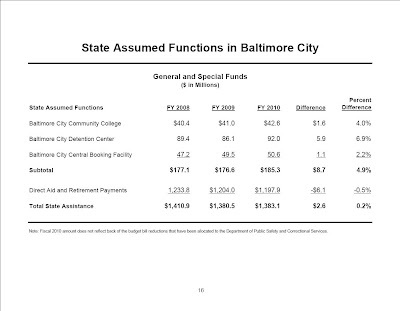 • MOE Penalty: If the SBOE finds the County did not satisfy MOE requirements the penalty could range from $33 M. to $57 M.
• Very little discretion in terms of tax increases - "tax room"
• Impact Taxes: Actual FY09 Receipts were significantly under budget ($26.5 million) and will be for FY10-14 as well and will need to be replaced with tax supporting funding or addressed through project delays. • Further service reductions and additional layoffs may be required given the foregoing and the pending imposition of further state aid reductions. • Need to present rating agencies with a plan for restoring reserves, OPEB, and PAYGO and aligning expenditures with revenues over the long term. • Need to leave the recession with a stronger fiscal position as we did in early 90's with Revenue Stabilization Fund, Retirement Savings Plan, Changes in Health Insurance premium share, and "tax room"
• Previous savings plans have relied heavily on lapse which is severely restricted due to additional lapse reduction of $2.7 million across departments and MC311 reductions of $1.875 million. • Furloughs, across all agencies, should be seriously considered as an alternative to further service reductions and layoffs. Baltimore Guy (and Sun reporter) Mike Dresser feels cranky about the I-270 widening proposal. Well, we have news for you, Baltimore – the I-270 project may be a better deal for you than for us! First of all, we can see where Baltimore Guy is coming from. The view around the state is that MoCo bullied its way into getting one giant road project – the ICC – and now we want to bully our way to getting another giant project to widen I-270. The problem with that view is that it gives us too much credit. The history of the ICC does not showcase MoCo’s ambition, but rather its schizophrenia when it comes to big road projects. Longtime County Executive Doug Duncan supported the ICC, but our County Council voted to oppose it by 6-2 in April 1999, 5-3 in March 2002 and 5-3 in July 2002. In 1999, the Council tried to rezone ICC-intended property as parkland, provoking a confrontation with the General Assembly. After the 2002 election, the Council voted 6-3 in favor of the ICC in December 2002 and 6-3 in favor in March 2005. The road finally began construction under Governor Bob Ehrlich, a Republican whom MoCo voted against twice. The County Council’s newest member, Nancy Navarro, won a tight special election in part because she opposed the ICC and ran against a pro-ICC state legislator. Does all of the above really lead you to believe that MoCo waged a relentless campaign to get the ICC? The proponents of the I-270 project say it’s about creating jobs, jobs, jobs. Let’s look at that argument. According to the Bureau of Labor Statistics, MoCo had more jobs than any other jurisdiction in Maryland in 2008. But that’s not all – MoCo’s jobs pay 23% better than the state average. And since MoCo’s income tax is a flat 3.2% and the state has had a progressive income tax since 2007, the state is the real beneficiary of those high-paying jobs. Now let’s find out who is paying the state’s bills. In FY 2007, MoCo paid $1.6 billion in income taxes and $453 million in sales taxes to the state government for a combined total of $2.1 billion. Baltimore City paid $342 million in income taxes and $287 million in sales taxes for a combined total of $629 million – less than one-third of MoCo’s payout. 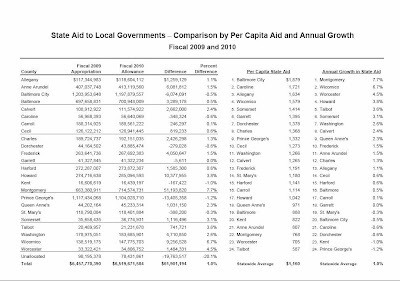 Baltimore City residents would have received $1,879 per capita in aid next year under the Governor’s proposal. MoCo residents would receive $768. If William Donald Schaefer and an army of Pratt Street accountants dreamed up a state aid system, it could hardly be more generous to Baltimore than the one we have now! But wait, it gets better. The state gives three times as much school aid per pupil to Baltimore as it does to MoCo. And the state has completely assumed funding responsibility for Baltimore’s Community College, Detention Center and Central Booking Facility. And Baltimore Guy is complaining about anything we get? All of the above points to a cardinal truth: every job created in MoCo because of the I-270 project means more state aid for the City of Baltimore. And Baltimore can roll up that cash without having to deal with all the extra traffic that will impact us if the project is built. Traffic is a huge issue here – 58% of our residents picked it is as our top long-term challenge in a recent Council of Governments poll. It is the primary reason that we sometimes vote politicians out of office for letting in too many jobs. Yeah, we’re funny that way. And we still think we’re smarter than everyone else! So do you really want to help us, Baltimore? Forget about I-270. Just loosen your development regulations, build a giant superhighway and double your population and employment. Then send a big chunk of those extra tax revenues to the state so they can pay for the majority of our school budget and take over funding responsibility for huge swaths of our local government. What did you say? You don’t like the sound of that? Hey, it worked for MoCo, right? 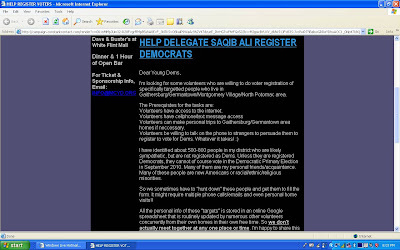 Delegate Saqib Ali (D-39) is nothing if not creative. After Help Save Maryland targeted him for defeat next year, Ali used their declaration to help him raise money. Following is his solicitation. As I conduct my work in our legislature, I try to be fair and judicious to all members of our society. Recently I voted against a bill state bill known as "Federal Real-ID". This was a complex bill with many nuances pertaining to illegal immigrants and drivers licenses. Because of my vote on this bill, and because they know I am compassionate towards immigrants, I drew the opposition of a local anti-immigrant organization known as "Help Save Maryland" (HSM). HSM has been declared a Nativist/Extremist group by the Southern Poverty Law Center -- a major national civil rights organization. They track and expose racists such as the KKK. HSM declared in a recent Gazette article that they are targeting me for electoral defeat. You can read that article by clicking here. (I have included the full text of the letter below for your convenience). Quite frankly, I think if the extremists are upset by my work, I must be doing something right! 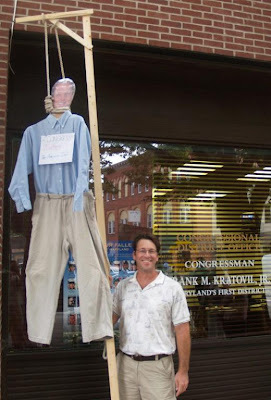 However, I still need your help to defeat mean-spirited efforts like this one to remove me from office. You can counter-act HSM by donating now to my campaign. Please make a contribution now by clicking here. No amount is too small or too large. And I certainly need all the help I can get. So please donate now. Last year, Ali recorded a greater net fundraising gain than any other Montgomery Delegate. His cash balance in January ($87,423.54) was higher than the rest of the District 39 delegation combined. So why is he looking so hard for more money? County Council President Phil Andrews sent the following memo to County Executive Ike Leggett today indicating that the Council will not support the Executive's helicopter proposal. 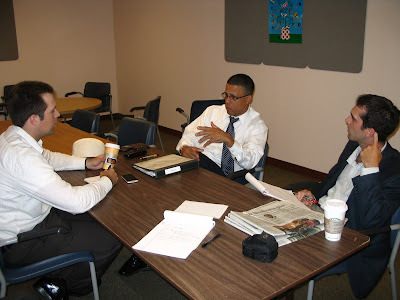 Last week, Lieutenant Governor Anthony Brown sat down with Cavan Wilk from Greater Greater Washington and me at the Silver Spring Library for a blogger roundtable where we discussed policy and politics. Lieutenant Governor Brown is a New York native. He served in Iraq, but has been in the Army or Army Reserve since 1984. In 1998 he was elected to the General Assembly from Prince George’s and reelected in 2002. In 2005, he joined the O’Malley ticket. He is Maryland’s eighth LG, a position created in 1970. Brown opened by discussing what a Lieutenant Governor does. In his case, the Governor has given him a few specific assignment areas to pursue. These include: chairing the BRAC Subcabinet, veterans issues, chairing the Maryland Healthcare Quality and Cost Council, addressing higher education with a focus on community colleges, foster care, and domestic violence. According to Brown, the Governor does not send him on specific errands so much as give him room to run with these broad issues to make progress for the state. Brown acknowledged that the O’Malley/Brown Administration has been about the budget more than anything else, including cutting spending, cutting programs, and containing costs. Brown emphasized that when elected officials talk about cuts, they are usually talking about curbing the rate of growth and not actual cuts. But Brown said the budget was smaller this year than the previous year, and for the first time since the 1970s the budget is actually smaller than it was three years previous. Presumably, Brown was referring specifically to the General Fund which has dipped below $14.5 billion in spending this year, a few hundred million less than the last few years. Our conversation took place just after the Board of Public Works (BPW) cut $280 million from the current budget. But preserved from the cuts, and according to Brown what will continued to be preserved, is K-12 Education. Brown trumpeted O’Malley/Brown’s funding of Thornton, including the Geographic Cost of Education Index and disparity grants which have at least seen partial funding under O’Malley/Brown. It was not clear if preserving education funding going forward meant not passing the approximately $125 million in Montgomery County teachers’ pensions down to the county. Brown also highlighted the Administration’s three consecutive years of higher education tuition freezes. But BPW just cut approximately $40 million from higher education, undercutting the argument that tuition freezes can be sustained because the state is providing enough in direct appropriations. Because Brown was a member of the Commission to Develop the Maryland Model for Funding Higher Education, I asked him about the sustainability of tuition freezes. The Commission report set ambitious goals for how much Maryland colleges and universities should charge compared to institutions in other states and how much they should provide in financial assistance. But to reach the goal, the report estimated a $750 million increase in costs and failed to recommend a funding mechanism. Brown said the funding mechanism was the set aside from slots proceeds for higher education. But funding for capital projects at community colleges and other higher education institutions is just one use of the education trust fund slots are supposed to benefit. And of course, slots do not appear able to deliver on their fiscal promises. The Lieutenant Governor recognized the limitations of the slots account even as he was explaining the funding. I asked Brown about the possibility that freezing tuition, as opposed to moderate increases tied to inflation or some other measure, would lead to large increases once the freeze ends, not unlike what has happened with energy rates. Brown said Maryland would not follow Florida, which has hiked public tuition by 15% this year. But he also said he preferred a year by year approach, rather than establishing formula funding tuition increases. Brown next turned to a long conversation on transportation, which we will discuss in Part Two. This is the weekend of the Montgomery County Farm Tour and Harvest Sale. Several farms are open for tours, produce picking, sales or demonstrations. Take advantage of the opportunity to visit working farms and orchards and further the efforts of the buy local experiences. Yesterday one of the sites I visited was Butlers Orchards near Germantown. There one can find field fruits for picking such as blackberries or just picked vegetables from the fields for sale in the farm stand. Families unloaded from cars and children hurried to pick their choice of fruit. Let’s all hope that our elected and appointed officials ensure that this experience continues for residents of our county. To get to this farm one must wander through a tucked away and beautiful area along truly rustic roads that traverse dense forests following meandering waterways with the occasional one lane bridge spanning the streams. Here, only moments from 270 and 355, the din from those bustling roads is not evident as the dominant sounds are those of birds, flowing waters and rustling branches. A youngster was spotting hopping across rocks in one stream as the sun glistened through the trees and the waters sparkled. Occasionally a meadow or farm field is spotted up from the narrow lanes that join the routes sometimes-steep inclines, where trees line the edge of the shoulder less roads. These roads have descriptive names such as Wild Cat or Davis Mill and all are urged to explore these quiet places while we can. Unfortunately, also noted, was a small cluster of luxury homes being built along Davis Mill – how long will it be before these homeowners will demand wider roads and straighter exits from their wooded hide-a-ways? How inappropriately sited this development seemed. Yet, I was reminded that some of this forested area is being considered for yet another highway – one that would carry the traffic from the mid-county highway (soon to be linked to the ICC) from its current terminus in Montgomery Village up through the Brink Road areas to near Clarksburg. It would go again through stream valleys and Seneca Park, while some routes would continue this passage through some of the virgin forests just described. Areas in the Dayspring retreat center, where meadow habitats and lively flowing waters are now protected, would be threatened with destruction. The county has placed signs at spots along Blount Road and other places noting the potential for this highway. Some potential routes would cross waterways in a dozen or more areas and would change the natural resources, degrade water quality and destroy plant and animal life in large measures. This is not stewardship of the environment – a phrase too often tossed around in political circles these days, but given lip service frequently. Recently I was among those requesting that the Maryland National Capitol Parks and Planning Board delay planned construction in the western area of Clarksburg near 270 because of the potential damage to the Seneca Creek watershed generally (because of impervious surface runoff among other concerns) and the Ten Mile Creek area specifically. Ten Mile Creek – to those of you who are down county – is an actual ford – where the stream waters are often flowing over the road surface. The testimony from Diane Cameron of Storm water partners can be read here and is representative of comments submitted. The decision was taken to indeed delay this construction; environmentalists throughout the area applauded this action. The county has spent millions of dollars to restore and reclaim some of our down county creeks and waterways, so it is a real positive note to see that the planning board took this proactive stand. Now – it is hoped that the council will continue to approve this delay despite demands by builders to the contrary. However we cannot just stop there and applaud; the community must remain vigilant and stop allowing channeling of streams as has happened with negative effects in Clarksburg already along with other sensitive areas in the county. Affected communities need to question claims that this actually protects the streams. It has been demonstrated many times that the straight stream is not the most effective way to direct water flow. In previous County Council testimony, contractors have noted that they are not always following the county water standards. Recent storms have sent mud and water flowing out from the construction sites along the ICC. Large tracts along the path of this monster highway have been cleared and are now clear-cut with no remaining undergrowth to hold storm waters. A recent article in the Washington Post noted the huge culverts and massive bridges that are being built over sensitive areas of the upper Rock Creek and Lake Need wood Park areas. The environment was supposedly protected with a runway for deer and other small animals. These structures were created which keep the traffic flow above the natural beauty below - supposedly minimizing the negative effects of this three Billion dollar highway. How much nicer could it have been if these natural areas had not been disturbed at all? Now back to the Farms and the upper county areas of beauty and quiet reflection. Is there will in this county to keep these forests, vistas, and farms and nearby crops? Is there a critical mass of those who would speak up for protecting what we have and keeping the Buy Local movement alive? Are the powers of those who would work to build highways at the cost of life quality and protection of the environment and our heritage greater than those who would protect our current choices for moderate growth? This question gives the county a clear choice and whatever choice is made can provide a critical tipping point for county residents, not just for ensuing decades but also maybe for the entire metro area. Can we – should we ever have to – sustain our growth and provide for food, energy, education, employment, transit and shelter for those who will live here? The Baltimore Sun’s Michael Dresser reports on a new website established by neighbors of one of the Red Line routes in Baltimore. The aim of the neighbors is to fight surface rail on the Red Line and they have drawn support from their state delegation. If the O’Malley administration heeds their concerns and picks an underground option, MoCo transit advocates should celebrate a huge victory. 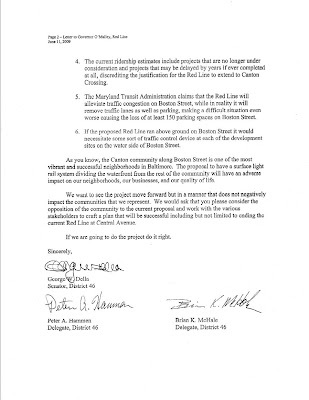 The arguments made by the Red Line’s neighbors against surface rail are familiar to Purple Line combatants from both sides: neighborhood destruction, pedestrian problems and inadequate infrastructure capacity for light rail. Their coalition may be as large as the group opposing light rail for the Purple Line. And they draw our compliments for their design choices on their website. Just as Purple Line rail opponents have done, they have obtained the sympathy of three-quarters of their state delegation: District 46 Senator George Della and District 46 Delegates Peter Hammen and Brian McHale. We reproduce their letter to the Governor below. But here is their problem. As we explained in a prior post, the Red Line fails federal cost effectiveness guidelines as an underground project. A transit project must cost no more than $23.99 per hour of user benefit to be awarded a “medium” cost effectiveness ranking or better. Anything less will endanger a project’s chances of federal approval. Only two Red Line options meet that standard: surface BRT ($18.10) and surface rail ($22.17). The underground options range from $30.42 to $63.93, all having “low” cost effectiveness by federal criteria. Now here’s where MoCo transit advocates should cheer. 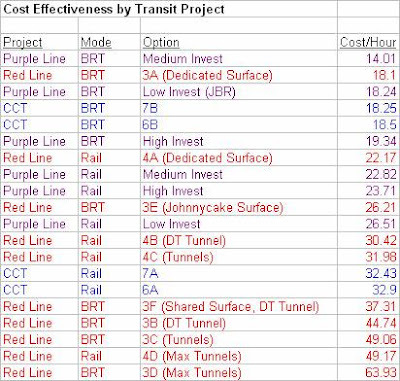 The Purple Line has five options with medium cost effectiveness or better: three for BRT and two for rail. (One rail option comes in at $26.51.) The Corridor Cities Transitway has two options with medium cost effectiveness or better, both using BRT. If the state picks any underground option for the Red Line, it will be greatly handicapped against MoCo’s two transit lines in competing for federal funds. So the O’Malley administration has an interesting choice. Most Montgomery observers believe the Governor has prioritized the Red Line over the MoCo projects by disproportionately targeting the latter for cuts last fall. But the Governor could prove everyone wrong by giving Red Line surface rail opponents what they want: an underground proposal to the feds. Martin O’Malley would be a hero to the Baltimore civic associations. He would also be a hero in the Washington suburbs if either the Purple Line or the CCT won federal approval over the now-hamstrung Red Line. That would be a rare win-win-win for the Governor, for Montgomery County and for Red Line neighbors in Baltimore! A recent Gazette article about Ike Leggett’s return to Vietnam forty years after serving in the war there left me wondering what other local politicians served in the military. The number of veterans serving in the US House and Senate has declined considerably over the years. According to a Congressional Research Service report, there are 96 veterans in the House and 25 in the Senate. That is compared to 398 in 1969 and 298 in 1979. None of the current Congressional veterans are from Maryland. Former Congressman Wayne Gilchrest served in the Marines. Andy Harris, who beat Gilchrest in the Republican primary and lost in the general election in 2008, served in the Navy Reserves. Former Governor and Comptroller William Donald Schaeffer was in the Army as well. I could not find numbers on how many veterans serve in the Maryland General Assembly and whether the number has declined. Statewide, Lieutenant Governor Anthony Brown serves in the Army Reserve and was deployed to Iraq in 2004. Comptroller Peter Franchot served in the Army. Locally, Leggett was an Army lieutenant during Vietnam. Other local elected officials who served in the military are state Senator Rob Garagiola and Councilman Mike Knapp. Garagiola was in the Army Reserves from 1995 to 2001. Knapp served for ten years in the Army Reserves. No one I spoke to knew of any other current Montgomery County elected officials who served in the Armed Forces. But if I forgot someone, I hope someone mentions them in the comments. One veteran I spoke to thought there was an important political constituency of veterans largely overlooked in Montgomery County. There are over 52,000 veterans in the County according to a Task Force to Study State Assistance to Veterans report. In 2008, Montgomery County established a Veterans Commission to study and make recommendations on veterans issues the County can affect. After World War II, military service was almost a prerequisite for a political career. As late as the 1990s, Bill Clinton’s lack of service was an issue during his two presidential campaigns, when he ran against two heroes of World War II. Clinton was the first US president since FDR not to serve in the military in at least some capacity. But as the number of World War II veterans still active in politics declines, so does veteran saturation in politics. I believe there are a few reasons for that decline. First, the entire country mobilized for World War II and over ten million Americans entered the Armed Forces. Far fewer serve now. Second, the veterans who returned from World War II were treated as heroes. But such uniform support did not exist in subsequent conflicts and military service was not as potent a line on a resume for a political candidate. However, public appreciation of veterans has been strong since 9/11 so that trend could be reversing with the new crop of veterans running for political office. At least one potential local candidate in 2010, Guled Kassim, has served in the Marines. If there are others, I hope they will be mentioned in the comments. Who else but Delegate Saqib Ali (D-39) would write something like this? I better not find a bone in my taco! As we revealed last week, County Executive Ike Leggett is requesting county funding to augment a federal grant for the purchase of two police helicopters. The County Council is considering the merits of that request. But whatever those merits may be, the Executive and Legislative branches must consider the political consequences of going forward. Simply put, Montgomery’s helicopters could very well throw the county’s Annapolis priorities into a tailspin. The Executive’s request to the council was remarkably short on specifics. While his request did outline acquisition costs of $248,894 in federal grant money and $279,890 in local funding, it did not estimate the maintenance and operating costs. Council staff volunteered a rough estimate of 1-2% of the total police budget, which under the Fiscal Year 2010 budget would amount to $2.5-4.9 million per year. The Police Department estimates the operating cost at $7.9 million over five years. The county faces a $350 million budget deficit next year. In normal times, this issue would be kicked around between the Executive and the County Council and eventually resolved. But these are anything but normal times. Montgomery County’s budget is extraordinarily dependent on the state government at the moment. Specifically, two issues will make or break us in the near term. State law requires that counties at least maintain their level of local school funding in order to be eligible for state aid increases. Montgomery County requested a waiver from this requirement from the State Board of Education this year owing to its poor economy, its fiscal problems and the tax-limiting consequences of the Ficker Amendment. The board denied its request so the county resorted to an accounting maneuver to get around the requirement. The board has requested an Attorney General opinion on the issue and it is far from clear as to whether Montgomery’s MOE compliance will be upheld. Our sources tell us that the helicopter proposal has been in the works for at least a year. That means that while the county was crying poverty to the State Board of Education, it was already considering purchasing helicopters. The Executive Branch further postponed its funding request until after the county budget was finalized in May. The state board and other decision-makers in Annapolis may very well conclude that the county made its case for a waiver in bad faith. After all, if it was secretly considering purchasing police helicopters, how could it credibly say it was too poor to afford its MOE requirement? Whatever the ultimate mechanism for settling the MOE dispute, this will diminish the county’s leverage and cast doubt on the veracity of its budget claims, both now and in the future. The state’s desperate budget situation ensures that state aid to counties, and specifically teacher pensions, will remain part of the budget discussions in Annapolis. In Maryland, the state pays pension benefits for teachers, school administrators and support staff. This is one of the few state programs that benefits Montgomery County since it pays its teachers more than other counties due to its high cost of living, and thereby generates higher benefit levels. Montgomery enjoys the highest absolute dollar benefit and the third-highest per-capita benefit of the state’s jurisdictions from this program. In the last general session, Senate President Mike “Big Daddy” Miller introduced a bill to phase in a handoff of teacher pension costs from the state to the counties. Montgomery would have been disproportionately damaged by that bill. Furthermore, the colossal unfunded liability in the state pension plan – which was, after all, caused by state fiscal policies – could very well be imposed on the counties. But Big Daddy’s plan is far from the worst scenario. A Western Maryland Delegate introduced a bill during the 2007 special session that would have wealth-adjusted the handoff of pensions. That proposal would devastate Montgomery’s finances just as it would protect other counties around the state. 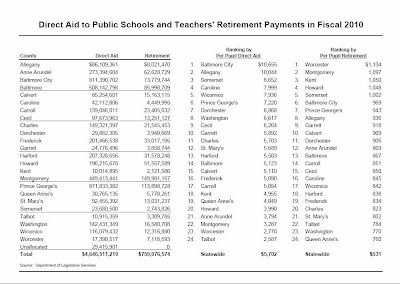 All of the reasons above explain why our state delegation’s highest priority, as supported by County Executive Leggett, is to prevent teacher pensions from being unloaded on the counties. Our delegation must make the case that we are not as rich as the rest of the state thinks we are to have a shot at preventing a Montgomery fiscal catastrophe. But if we appear to be wealthy enough to splurge on helicopters, that case will be laughed out of the statehouse. Regardless of its merit or county budget impact, this proposal will kneecap Montgomery in Annapolis. Big Daddy will gleefully embrace MoCo’s helicopters if they make it easier for him to send teacher pensions to the counties. Ike Leggett will no longer be able to draw lines in the sand over teacher pensions if the helicopter rotors are blowing them away. And if the State Board of Education gets a chance to punish Montgomery for its Maintenance of Effort compliance tactics, they will do it without regret. The Executive Branch has already demonstrated its strategic insensitivity to our state budget leverage, but it is not too late for the County Council to do better. They should send the helicopters back to the launch pad, at least until the county and state budgets improve. If they don’t, the helicopters will crash land at the statehouse - and Montgomery’s agenda will go down with it. In an email exchange widely circulated in Annapolis, Senator Jim Rosapepe (D-21) and Delegate Dereck Davis (D-25) hold a spirited duel on the issue of electricity reregulation. Davis is the Chair of the House Economic Matters Committee, which has jurisdiction over electric utilities, so he will be a big player in writing any electricity legislation. Come behind the closed doors of Annapolis and read on! The duel began when Rosapepe sent out an email to many state legislators recruiting them to sign a letter to the Chair of the Public Services Commission (PSC) in support of reregulation. I'm writing to invite you to join Senators Currie, Frosh, Peters, Madaleno, Muse, Kramer, Pinsky, Raskin, Harringon, Lennett, and me in supporting Governor O'Malley's efforts to reregulate electric rates and explaining how his efforts in the Constellation/EDF case will benefit Pepco customers, who we represent, as well. Please call me on my cell at [number withheld] if you have questions, or let my staff know if you'd like to sign on. Please let us know by 5:00pm on Wednesday. We write to express our strong support for your efforts to protect Maryland consumers by reversing the dramatic failures of electric deregulation. In particular, we appreciate your work advising the legislature when the Senate passed the Governor's reregulation this year. This legislation advances new power plant construction and long term energy planning. We look forward to working with the Governor to pass it through both houses of the General Assembly in 2010. Meantime, since our ratepayers are suffering from excessive rates for electricity produced by existing plants, we applaud your decision to review the Constellation/EDF transaction. As you know, Governor O'Malley has proposed conditioning approval of this transaction on inclusion of several key protective measures for consumers, including lower rates for customers and launching the return to regulated rates for the future. First, the CEG/EDF case and the reregulation legislation we hope to pass in 2010 are aspects of the same battle for consumer rights and a return to fairness in the electric markets. Since Constellation was the major local proponent of deregulation in 1999 and remains its major defender to this day, prying Constellation away from this historic failure will create momentum for reform across the state. Second, as your consultants demonstrated last fall, reregulation would save ratepayers billions of dollars, even if done in arm's length transactions. They showed how Pepco customers could save $1.6 billion. Deregulation defenders like Constellation have claimed that reregulating rates of existing power would be "too complicated." By restoring healthy regulation and oversight in the Constellation/EDF case, as the Governor has proposed, the PSC would demonstrate the feasibility and benefits of this approach, providing just the model we need for reducing Pepco’s inflated rates as well. As you move forward in the Constellation/EDF case, we urge you to look for similar opportunities in the Pepco service area to reduce our constituents' electric bills by reregulating their rates. We recognize that such an opportunity may not appear immediately. But Pepco customers, like BGE and all other Maryland ratepayers, have suffered mightily from excessive electric rates. No opportunity to protect our people should be missed. We thank you for your attention and urge you to continue in your important work. Thank you for the invitation to sign the letter below "supporting Governor O'Malley's efforts to reregulate electric rates". I appreciate your diligence and commitment to this most important issue facing our state. Respectfully, I have to decline this invitation on practical as well as philosophical grounds. First of all, I strenuously disagree with your implied assertion that the enactment of SB 844 would lead to lower electric rates. Chairman Nazarian met with Delegate Brian McHale and myself on February 27th, immediately following the House floor session, to discuss this matter. During the course of this meeting, he very pointedly stated that even if we enacted this legislation "it would take years, if not decades, to fully reregulate" our electricity markets. He further stated that he could not guarantee that our constituents would realize lower rates in the near or the long term future. This admission was especially alarming to me because I had previously heard that it would cost approximately $16-20 billion to fully reregulate. As I know you are aware, utilities would be granted full cost recovery from the ratepayers for these new generation plants. That is a mighty big gamble for no guarantee of rate relief. Secondly, I am confused by your statement that "Governor O'Malley has proposed conditioning approval of this transaction...". I may be misinformed but I thought that under the Public Utility Companies Article, this decision falls within the purview of the Maryland Public Service Commission. This may seem like a minor point to some but a significant part of the 2006 debate about electric rates centered on the lack of separation between the PSC and the Ehrlich Administration. Many Democrats, including both presiding officers, lamented the fact that there appeared to be a lack of independence being exhibited by an independent body. If what you are asserting is true, then isn't history just repeating itself? Shouldn't we allow the well-qualified, professional regulators to do their jobs without political interference? I am not suggesting we abdicate our responsibilities but by the same token, we should not over-extend our reach either. Thirdly, I am extremely concerned about Maryland's business reputation. The General Assembly enacted SB 1013-08 after extended discussion among representatives of the governor, legislative leaders, PSC, and Constellation Energy Group(CEG). These discussions yielded numerous benefits for ratepayers within the Baltimore Gas & Electric service territory that totaled several hundred million dollars, including $18.6 million annually until 2016 for the decommissioning of Calvert Cliffs 1 and 2, a one time $187 million credit against residential customer electric bills, and $520 million from PSC Order 75757. It was understood by all parties that this would close the door on the 1999 matter and the state would move forward. It appears that just one year later, the spirit of that agreement is being violated. In addition to the spirit of that agreement being violated, I am also taken aback by the methods we are employing relating to the CEG/EDF partnership. While I applaud the state's unrelenting commitment to affordable electricity, the end does not justify the means. Our methods and constantly changing energy policies are having a chilling effect on our utilities' bond ratings. One question I have that no one has answered is what happens if this transaction doesn't go through? The proposed third nuclear reactor at Calvert Cliffs is a major part of the state's future energy plans. If EDF pulls out of the deal or if the PSC denies the deal because certain concessions were not made, Constellation is back in a very tenuous financial position. Not only will this major component of our future energy plan be in jeopardy, a major employer in the state might go bankrupt. Who's going to accept responsibility for all those lost jobs and tax revenue? Finally, I am interested in knowing the basis of your often stated opinion that Constellation "was the major local proponent of deregulation in 1999." With all due respect colleague, you were not a member of the General Assembly when this discussion took place. You resigned from the House of Delegates effective December 31, 1997, to become Ambassador to Romania. During your ambassadorship, I was a member of the House committee with jurisdiction (Environmental Matters), I served on the legislative taskforce that studied the issue, and I participated in many of the discussions involving the various details. Trust me when I tell you that the utilities, including BG&E, were opposed to changing the current system. They talked a brave game about not being afraid of competition but the fact of the matter is who would want to change a system where they were guaranteed cost recovery for their expenses as well as a guaranteed rate of return? The only entity that was really pushing this policy change was a multi-national corporation based in Houston, Texas. The House Economic Matters Committee is diligently reviewing all the relevant issues and is committed to finding the best course of action. If the facts support reregulating, then we will lead the charge in that direction. If the facts do not support it, no amount of political pressure will lead us to implement a wrong decision. Thanks so much for your long and thoughtful letter. Very impressive work -- and at 11:26 at night! I look forward to discussing these issues in detail with you, as we did early in the last session. It's terrific that the committee is taking up the issue in preparation for the next session. For now, I'll just briefly respond to each of your points and questions. First, I agree there are no guarantees in this life -- or in reregulation of electric rates. But Maryland tested regulation for decades and it produced reliable electricity and reasonable rates. Proponents of deregulation promised lower rates and more supply. Instead, in ten years, rates have gone up more than 70% and no new major generation has been built in the state. The governor believes that increasing supply with regulation will hold down rates in the long run, based on the simple economics of supply and demand. I agree with him. Second, I agree with you that the PSC has the regulatory responsibility to approve or disapprove the EDF investment. But, as you know, the governor has provided strong leadership for consumers by making the state an official "intervenor" in the case and has proposed to Constellation a generous compromise to assure that the benefits of potential PSC approval are shared with struggling ratepayers, not just with Constellation CEO Mayo Shattuck, who is in line for an $87 million payout. The governor's proposal is available on the web and has been widely reported in the press. Third, I share your concern about Maryland's business reputation. Deregulation made our state less competitive for all kinds of businesses, as well as residential consumers. Lower, more stable energy costs are always a competitive advantage for a business and for a state. The governor has proposed a business-like approach to Constellation's request for the PSC to allow it to be bailed out by EDF. As you know, the management of Constellation almost bankrupted the company, as so many Wall Street banks did, by taking bad financial risks in pursuit of excessive executive bonuses. Consumers have paid the price in higher electric rates. The governor is just seeking a fair deal for our constituents. Fourth, if EDF decides to withdraw their offer, other investors would no doubt come behind them. As a result of President Obama's efforts, the financial markets have materially improved since last September. But, even at that time, when Constellation faced ratings downgrades because of mismanagement, it had TWO offers -- one from Warren Buffett and one from a consortium of EDF, KKR, and TPG. 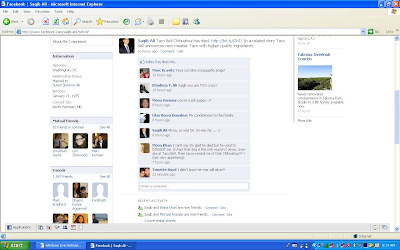 Fifth, I agree that I was in Romania, not in Annapolis, when deregulation was passed and that ENRON was the major out-of-state proponent of deregulation. The basis of the letter's statement that Constellation was a supporter of deregulation in 1999 is the recollections of others who were there then, including signers of the letter. We can agree that memories of people of good will can differ. Nonetheless, I'm sure we can also agree that Constellation is today the state's biggest and most aggressive protector of deregulation. Thanks for your serious attention to this issue and I look forward to working with you on it. In reading the above exchange, we are struck by the frequency with which Rosapepe targets Constellation. The energy giant is certainly unpopular and is therefore an inviting political punching bag. That fact may count far more with the politicians than Dereck Davis's concerns over financial issues and business reputation. We are not as cynical as Blair Lee on the political positioning with regards to Constellation, but this exchange makes us wonder. If the politicians really want to save us money, they should send our analysis of how we can save double digits off our power generation bill to their constituents right now. That blog post is one of the most popular items we have ever published. Individual consumer action may not get politicians re-elected, but it can save Marylanders lots of money. Everyone in Annapolis should be asking themselves which of the two is more important. Ike Leggett on MoCo's Demographic "Problem"
Print MSM to MoCo: Adios!